Stella McCartney’s gangStella gives great red carpet consistently, but it wasn’t Stella gang’s night this time. Anna WintourIt’s her night, she can wear what she wants. And she wants THIS? Lupita Nyong’o Don’t worry, she’ll dry clean this before she returns it to Cher. And no criticisms please – she’s got the fashion immunity card for one year. Sarah Jessica ParkerIf anyone was going to suit a debutante-style theme it would be SJP. 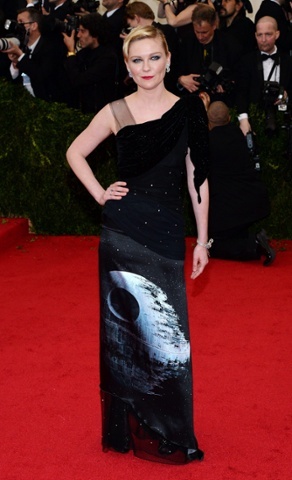 But does the designer’s signature at the bottom of the dress have a little bit end-of-the-pier-artist about it? Georgia May Jagger Someone interpreted the white tie and decoration dress code as ‘tux and tummybutton’. Maggie GyllenhaalThe label is Valentino but the effect, alas, is Sitcom Kaftan Chic. Ed Burns and Christy Turlington Pure class in Calvin Klein on Christy’s part, shame Ed’s bowtie needs a little pick-me-up. Joan SmallsFishtail plait from East London, dress from Vera Wang, blue lips from the left-field. Tom Ford and Benedict CumberbatchTom and Ben: two dudes in the same clothes but a century apart in style. Tom looks 2014, Ben looks 1914. Donatella VersaceWho knew there was some moss green chiffon knocking around the Versace atelier, huh? And some sort of kid’s maths toy. Waste not want not, Donatella. Emma StoneSo much love for this Thakoon outfit. Lavender and fuchsia on the red carpet, the sporty vest-styling on the top, and the Pippi Longstocking plait. J Law better watch out, because Emma has her eyes set firmly on the Modern Sassy title. Marion Cotillard Such a classic French chick move to wear something navy and knee-length and make everyone else feel bit naff and over-done. Love this Dior dress: a classic shape in a modern fabric. And the one huge diamond earring. Not at all sure about the shoes, but full marks for trying something different, I guess? Kate Upton I think UK Vogue’s current cover star was going for Sicilian grande dame, but it ended up more like: ‘Austrian serving wench in deep mourning, wearing a flowery swim cap.’ Don’t you hate it when that happens? Diane Kruger and Joshua Jackson This woman is proof that being blond and classically beautiful and wearing pretty dresses is categorically not enough to make anyone give a toss about you. She’s wearing Hugo Boss, should you care, but you don’t, do you? Kirsten Dunst You know what’s wrong here? The hair and make-up. With a dress as extreme as this – sci fi from the waist down, John Singer Sargent’s Madame X from the waist up – you need a simple look. Maybe a sleek ponytail and a choker. Not a boring chignon and diamonds. Alexa ChungAbsolutely love this. Only Alexa can make ice-blue taffeta look this good. The crunch and rustle of the fabric, the bows and the bejewelled shoes all nod to the Charles James era, showing off Alexa’s fashion know-how, but the final look is modern and cool. David and Victoria BeckhamThe chic, off-white yin to the matching-black-leather-jackets yang of pre-makeover Brand Beckham. Note: no legs, no cleavage. Also, don’t you love a man who lets you put your phone and eyeliner in his pocket so you don’t have to take a bag? Sigh. Hailee Steinfeld17 going on 70. It’s elegant, yes, but does it remind anyone else of those Stella McCartney trompe l’oeil dresses of red carpet’s recent past? In ball gown form?